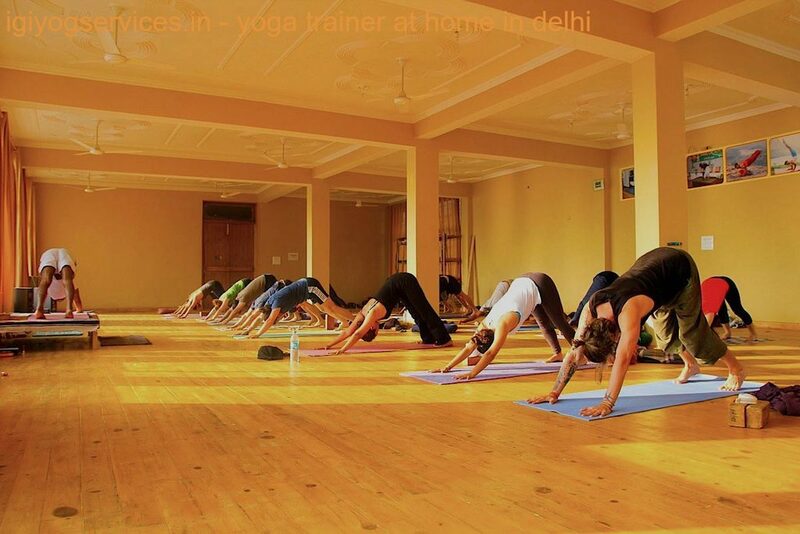 Home Yoga Instructor For Eyes | Yoga Trainer At Home For Eye Problem | Yoga At Home For Eye | Yoga Classes At Home For Eye | Personal Yoga Teacher In Delhi For Eye | Home Yoga Teacher In Janak Puri, delhi cantt, rajouri garden, kirti nagar, shiv nagar, vikaspuri, uttam nagar, hari nagar, naraina | Personal Yoga Trainer At Home | Home Yoga Instructor For Eye | Power Yoga Trainer For Eye | Home Yoga Trainer For Eye | Home Yoga Classes At West Delhi | Home Yoga Classes At East Delhi | Home Yoga Classes At North Delhi | Home Yoga Classes At pitampura | Personal Yoga Trainer At Home in Rohini | Power Yoga At Home in in Inderpuri | Home Yoga classes in R K Puram | Power Yoga Classes For Ladies At Home | Meditation Classes At Home | Yoga Classes At Home For Women in Model Town, in darerwal nagar | Power Yoga Classes At Home in East Of Kailash | Yoga Classes For Diabetes At Home | Yoga Classes For Asthma At Home | Yoga Classes For Heart Problem At Home | Power Yoga For Womens At Home | Yoga Classes At Home For Men | Home Yoga Trainer For Weight Loss in west punjabi bagh| Female Yoga Trainer At Home in old/new Rajender Nagar |Female Yoga Teacher At Home in karol bagh | Yoga Classes At Home For Female in patel nagar | Female Yoga Trainer In Delhi | Female Yoga Teacher In Delhi | Yoga For Kids | Yoga For Children | yoga at home new delhi, delhi | yoga teacher in delhi for home visit | yoga instructor in south delhi, south extension, malviya nagar, Hauz Khas, greater kailash, new friens colony, Vasant Kunj, Vasant vihar, safdarjung enclave, Lajpat Nagar, Shastri Nagar, kalkaji, green park | yoga classes in delhi | home yoga classes in vaishali | yoga classes in south delhi | home yoga classes in Vasundhara Enclave | yoga classes in north delhi | yoga trainer in gurgaon | power yoga in gurgaon | Yoga trainer at doorstep in noida | yoga teacher at doorstep in faridabad | Power Yoga Trainer For Females in GK-1/GK-2 | Home Yoga Trainer At West Delhi | Home Yoga Trainer At East Delhi | Home Yoga Trainer At North Delhi | Yoga Trainer At Home In South Delhi | Meditation Yoga Trainer At Home in krishna nagar | yoga teachers For Eye | yoga instructor For Eye | Pranayama | Breathing and relaxation techniques | Meditation for stress management | Power yoga classes | yoga for weight loss | yoga for general fitness." Procedure: To do this rotation, sit down in Padmasana with your head and spine erect and hands resting on your knees in yoga mudra. Lift the right fist with thumb facing upwards. Keep your elbow straight while doing so. Focus your eyes on the thumb, keeping your head straight. Move your thumb clockwise with your gaze following it. Repeat this five times and do the same anti-clockwise for another five times. Repeat the entire process by shifting your gaze towards the left thumb. 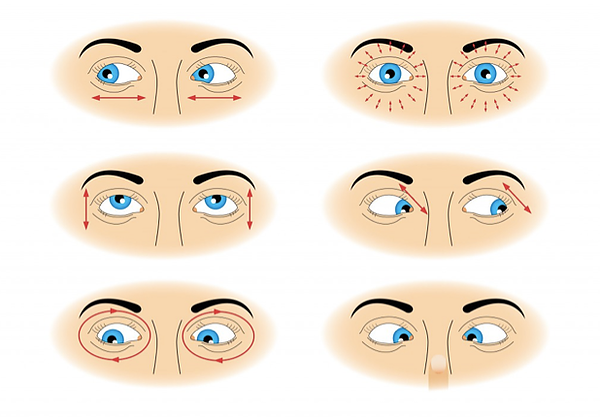 Benefits: Clockwise and Anti-clockwise rotations relax the eyes and safeguard them from any diseases and disorders. This exercise is ideal for those who spend long hours in front of the computer. 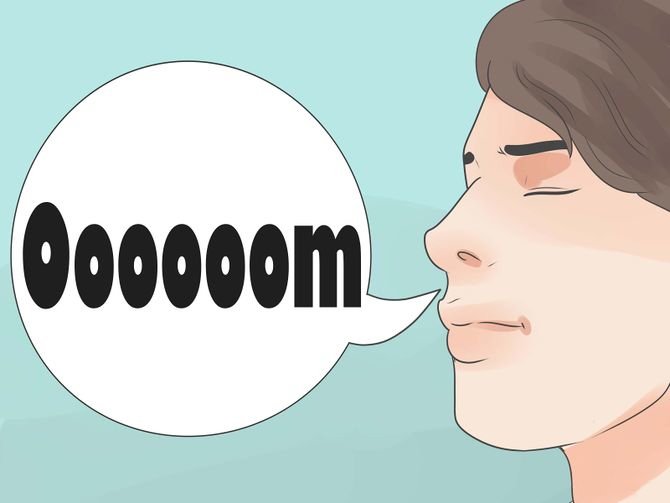 times, closing your eyes for 10 seconds after every repetition. Benefits: Side movement of eyeballs is good for people with myopia and hypermetropia. it on your right knee with the thumb facing upwards. Keep your gaze fixed on any object in front of you. Now, breathe out deeply and take your gaze upwards, keeping your head fixed. Breathe in and get back your gaze to the object. Do the same from lower gaze to upper gaze. Repeat the same procedure with the left fist on your left thigh. Close your eyes for 15 seconds before repeating the exercise. Do the exercise 10 times. Benefits: Constantly moving your eyes helps keep eye disorders at bay and improves vision. 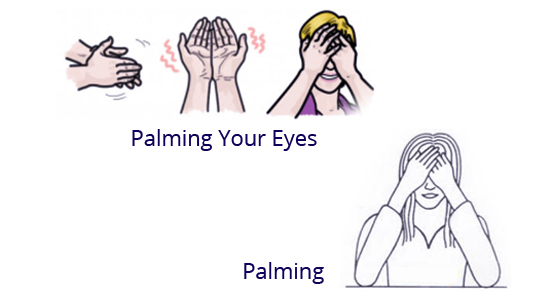 Benefits: Palming is warming up your eyes for better circulation. It is a quick and easy way to relax your eyes. It improves blood circulation and keeps tiredness and puffiness at bay. 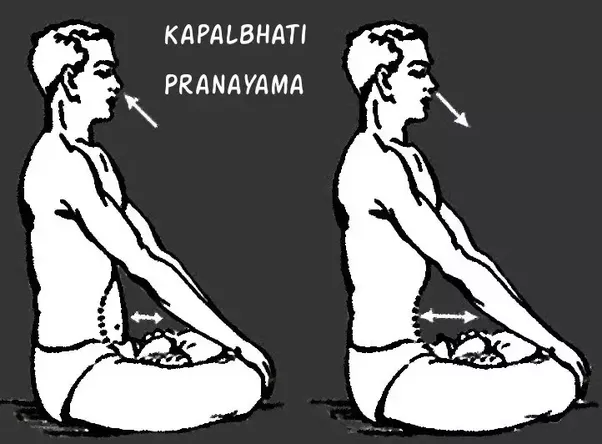 Procedure: Sit down in Padmasana with your spine erect. Using your right thumb, close your right nostril. Inhale and exhale forcefully and quickly through your left nostril. Do this about 20 times. You can feel your abdominal walls bellowing while doing the exercise. Make your last breath, long and profound. Now, repeat the same process on your right nostril with the left thumb closing the left nostril. Finishing the exercise on both the nostrils makes for one bhastrika. Relax for about 30 seconds and repeat the entire process again. Do it for about 10 minutes. Benefits: Bhastrika Pranayam boosts blood circulation to the head and improves vision. It also refreshes your physical and mental being. Procedure: Sit down comfortably, either in Padmasana or Vajrasana. Place a candle at about two feet from where you are sitting. Light the candle and gaze at the flame without blinking. You can count numbers in your head to keep track of time and for your mind to not waver. Look as long as you can. The longer you do, the better. Benefits: Trataka means to gaze at an object continuously for a fixed period. Doing so improves your concentration and vision. This eye exercise lowers high myopic eye powers. Procedure: Stand with your legs apart from each other and take a deep nasal inhalation. Bend your knees slightly.Bend your head slightly downwards and exhale through your mouth.Make sure that the back is erect always, with your abdominal muscles in the relaxed position. Pull your navel up and inwards so that it comes closer to your spine.Hold your breath for about 15 counts and then flap the abdominal muscles, forward and backward for 10 times with the breath under hold. powerful one and beginners could find themselves subjected to back ache.Close your eyes and keep your hands in yoga mudra.Focusing on your lower abdomen, make a quick inhalation followed by powerful and quick exhalations, [about 8 to 10 per inhale-exhale cycle for 1 to 2 seconds], to start with. A beginner can keep her hand on the belly as she might find it difficult to concentrate during the initial repetitions.Increase the number of cycles slowly. With regular practice, you can reach up to 100 counts. Benefits: Cleanse your lungs and improve your circulation for a better vision with this skull shining breathing exercise. This is a very powerful exercise that ensures you a flatter tummy, better vision, lustrous hair, and much more. The inhalation is almost nil while exhalations are powerful and in rapid succession. from 5 to 7 minutes. Benefits: Along with being an excellent way to improve the circulation and cleanse the lungs, this also helps in easing disorders associated with reproductive organs. Make sure that this pranayama is performed on an empty stomach. Procedure: Sit comfortably in Sukhasana or Padmasana.Take a deep inhalation.As you exhale, chant Om as long as you can. The longer you can hold your breath, the better the results are. One chanting completes one round. Relax with your eyes closed, breathing normally, for about 15 seconds before moving ahead with the next repetition.Repeat this for 2 to 3 minutes, to begin with, increasing the duration to 10 minutes gradually. Benefits: This is basically a meditation exercise, wherein you are expected to chant “OM”. This is ideal for those who want to relax. Kids can practice this to boost their memory power. This breathing exercise involves inhalation and exhalation of longer duration. 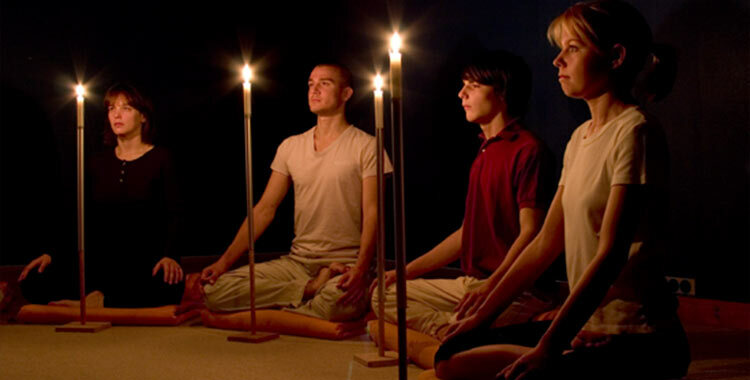 Procedure: Sitting in Padmasana or Sukhasana, stretch out your hands, resting the palms on your knees in yoga mudra.Lift your right hand in Pranayama mudra.Using the thumb, close the right nostril.Take a deep inhalation with the left nostril.Closing the left nostril, allow exhalation through the right nostril.Now, inhale through the right nostril and allow exhalation via left nostril.This completes one round of Anuloma – Viloma Pranayama.Repeat for 10 to 15 times to start with, increasing to 50 to 75 times, gradually. Benefits: This is the easiest of the pranayamas and is also known as the title="home-yoga-instructor-for-eyes" alternate nostril breathing exercise. Procedure: Lie down in supine position.Keep your feet together or stretched out, as per your comfort level. Allow your hands to rest on either side of the body, palms facing the ground. Close your eyes. Inhale and exhale deeply, allowing your body to relax completely. 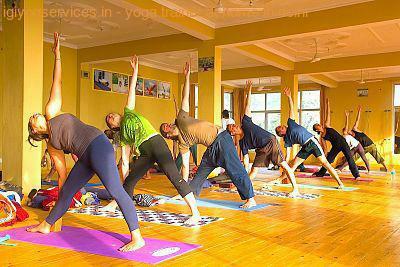 Benefits: You should allow your body to relax after any workout session and the Corpse Pose is the ideal asana.